First off, if you love Baseball, skip this post for a minute and go claim one of the 1,000 beta accounts we have for Baseball Boss – click “register” on the top left and use the code “techcrunch” to get in. Then come back here and see why you’ll be glad you did. 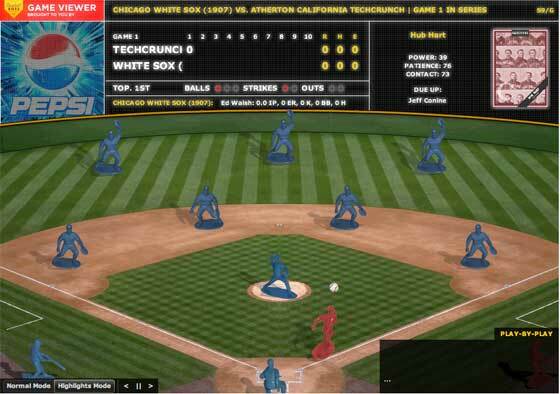 Baseball Boss is the second game title from Texas-based Challenge Games, which launched Duels.com in August 2007. Duels is an asynchronous gaming platform that lets users build fantasy characters and fight duels against other users. Users loved it so much that the platform ground to a halt within hours, and the company spent weeks adding servers and trying to keep up with growth. By December a million characters a day were being killed on Duels (no problem, you could get back up and fight again). Baseball Boss runs on the same platform as Duels, but the game is completely different. 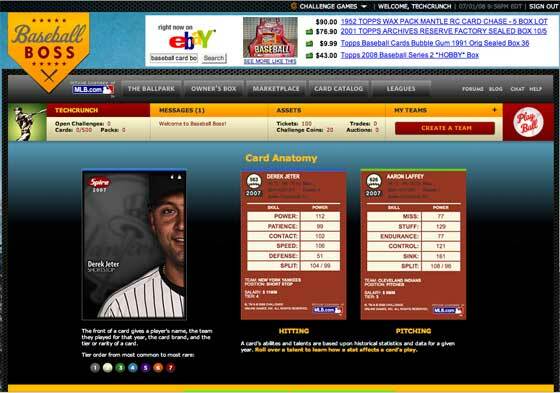 Instead of creating fantasy characters and arming them with swords and spells, Baseball Boss lets users build fantasy baseball teams using real players (they have a licensing deal with Major League Baseball). You create a team using real major league players from 1907 or 2007 (the more years will be added over time). To start you are given 40 players, displayed as baseball cards. 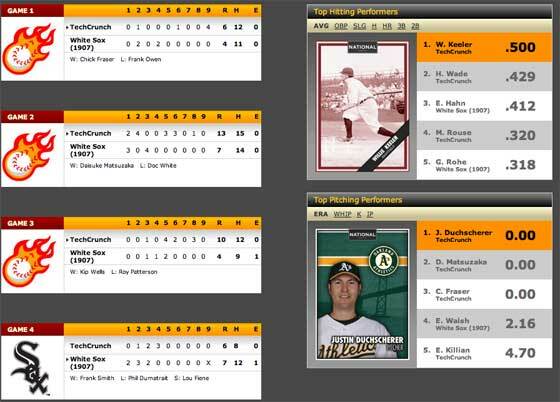 The game will auto-create a team for you based on your best players, or you can go in and tweak each player individually, including setting the pitching roster and batting order. You then challenge other teams. If they accept, the game is played. Like Duels, the two players do not need to be logged in at the same time to play against each other. All of the settings are determined prior to the game, and the computer then plays it out, using chance and player statistics to determine each play of the game. You can actually watch the entire game afterwords via Flash in you like. In my first five game series, my team of misfits beat the 2007 White Sox in four of them, leaving my record at 4-1. You can improve your team by trading players, and you get new players occasionally when you win. You can also purchase packs of cards in a marketplace. Each player has a “rarity” score of 1-7 as well as a salary. For now, salary caps don’t come into play, but eventually the game will host tournaments and use salary caps to keep things more even. The company also says they will eventually allow you to upgrade your players as well (and no, the upgrades won’t be called “steroids”). So here’s the thing – I’m not a huge baseball fan, but I spent hours yesterday “testing” the game and talking to the company. It’s incredibly easy to play to start, but you can spend limitless amounts of time tweaking and customizing your team to win a few more games. I eventually had to cut myself off from Duels last year when it started to affect my writing productivity. Now it looks like I’m going to have the same problem with Baseball Boss.